Despite the extended “Day of Silence,” Russian-terrorist troops deployed in the combat zone in Donbas continued to open fire, including prolonged shelling. During the past twenty-four hours, the enemy delivered fire over several hours in the area of Marinka (firing small arms and ZU-23-2 anti-aircraft cannons). To the south of Avdiivka, enemy fire (small arms and mortars) lasted approximately 1 hour. Shorter firing attacks were also reported on other sections along the combat line in Donbas. In an area to the northeast of the Donetsk Airport, a group from “Rosich” 7th special forces squad of the Russian MIA Internal Troops was on the move when it came under fire from a mortar squad of local insurgents, who mistook the Russian military servicemen for Ukrainian special forces. There are casualties among the Russian special forces; according to our preliminary reports, the group’s commander was destroyed. We received reports that near Nikishyne, units of Russian-terrorist troops are withdrawing from the line of contact with Ukrainian troops. The long-term combat goal of the enemy in this area was to destroy the support point of Ukrainian troops and “squeeze” our units out of this area. According to a representative of the command of the so-called “Cossack” formations, the defense of Ukrainian troops is rather effectively organized in this area, and prevents the insurgents from achieving the above goal. At terrorist checkpoints near Bryanka, terrorists from the so-called “Cossack units” are stopping passing civilian vehicles and forcefully “enlisting” male civilians, under threat of armed violence. Near Yasynuvata, insurgents are continuing their attempts to repair shot and damaged military equipment. Taking advantage of the “Day of Silence,” terrorists use tug trucks to try and evacuate the damaged equipment (about a dozen units). While they succeeded in evacuating 2 tanks and 2 APC, repair and restoration of the equipment remains problematic for them, due to lack of qualified specialists. Insurgents are discussing the idea of “luring away” Ukrainian military specialists from the repairs base in Artemivsk. How they are planning to accomplish this remains unknown. Ukrainian checkpoints are tightening up control over the movement of citizens and civilian vehicles. Earlier, the IR group received reports of multiple cases of insurgents (including unit commanders) disguising themselves as civilians to enter the territory controlled by Ukrainian troops. Another terrorist supply convoy (about 10 trucks, mainly delivering ammunition) entered Yasynuvata. 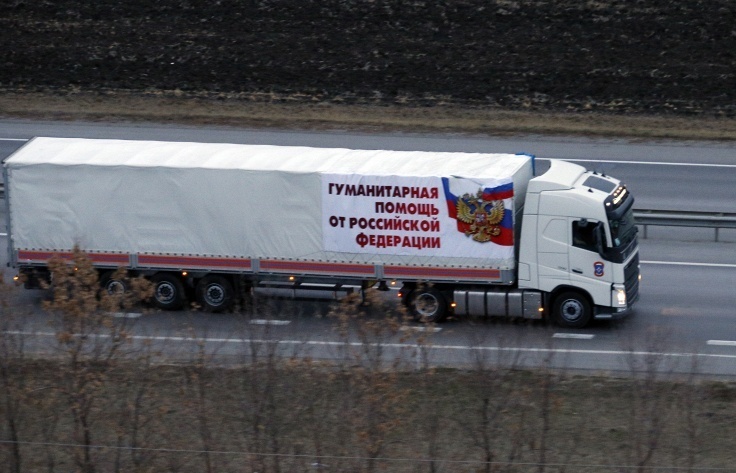 Empty trucks (up to 15) escorted by Russian military servicemen moved through Shakhtarsk, heading towards the state border with Russia. This entry was posted in Dmitry Tymchuk, English, English News, South&Eastern Ukraine, War in Donbas and tagged #RussiaInvadedUkraine, #UkraineUnderAttack, Dmitry Tymchuk, Information Resistance, Ukraine, war in Donbas. Bookmark the permalink.